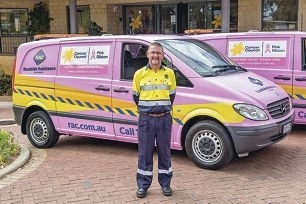 Wanneroo resident Charlie Atkinson with his pink RAC patrol van. The RAC has changed the colour of two of its yellow roadside assistance patrol vans in support of Cancer Council WA’s Pink Ribbon campaign. Mr Atkinson will be driving his van around the northern suburbs during October and said he was proud to be a part of the campaign as he had watched people close to him battle cancer. ‘Years ago I remember watching my grandmother battle breast cancer ” and win,’ he said. ‘Then in 2008 one of my former RAC colleagues was diagnosed with breast cancer. The RAC will donate $5 to the Pink Ribbon campaign for every breakdown the pink vans attend during October. If people assisted by the vans take a selfie and post it on social media, the total donation for that pink van for the day will be doubled. ‘I hope by driving the pink patrol van and encouraging people to donate, those touched by cancer will receive the help and support they need,’ Mr Atkinson said.